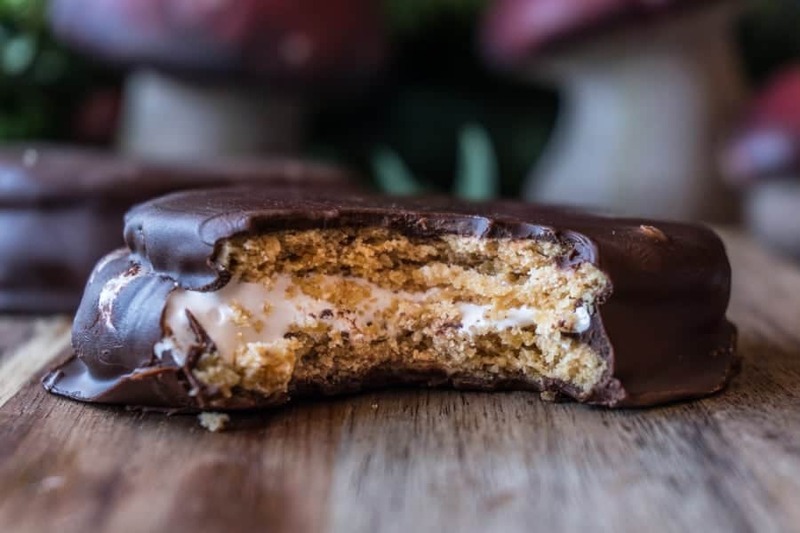 These moon pies are homemade, easy to make, and taste amazing! The perfect dessert every time! 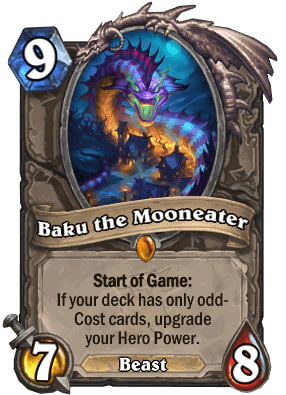 This recipe is based off of the fun Hearthstone card, Baku the Mooneater! Since he eats moons, he surely eats moon pies! Baku really likes odd numbers, so the amounts of each ingredient in this recipe are odd and this recipe makes an odd number of moon pies! If you aren’t familiar with Hearthstone you can read all about it here! 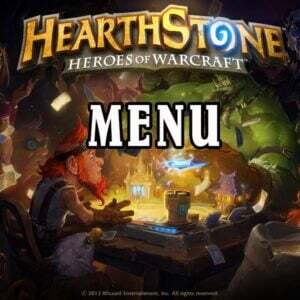 Also check out my entire Hearthstone inspired menu! Perfect for your next tavern brawl or LAN party! 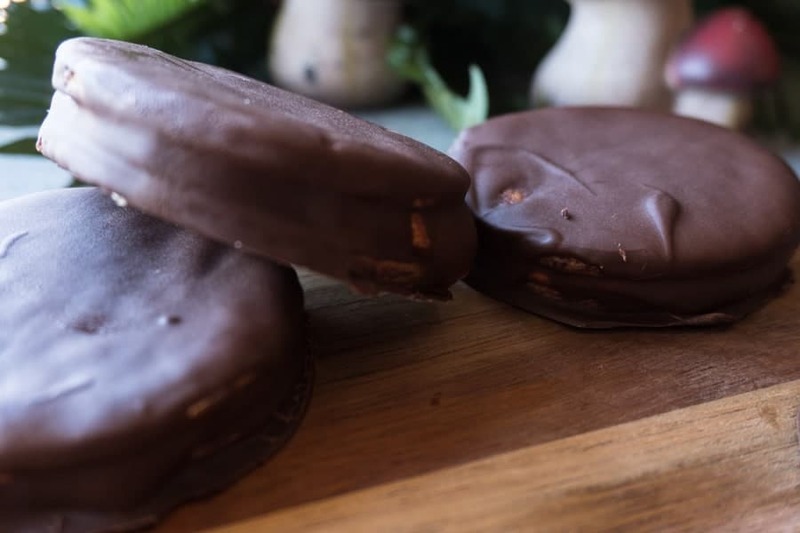 These Baku Moon Pies are an easy dessert that is sure to be a crowd pleaser! Crush graham crackers in to a fine crumb- if you have a food processor just put the graham crackers in there and process! If you don’t have a food processer, put the graham crackers into a gallon Ziploc bag and using a rolling pin or your hands crush the graham crackers! Add all the dry ingredients together and then add in the butter and milk! Stir until combined! Roll out into a flat layer and cut with a circular cookie cutter. Alternatively you can use a cup turned upside down to cut circles out of the dough. I used a large cookie cutter, but if you use a smaller cookie cutter (or cup!) you can make mini moon pies! Transfer your cookie cut outs to a parchment lined baking sheet being careful not to distort the shape (using a thin spatula will help!). Bake at 325°F for about 10 minutes. The cookies should start to smell really good by this point. Take them out and let them cool, then once cooled add a dollop of marshmallow cream onto half of the cookies (I got 26 cookies total, so I put marshmallow on 13 of them) and refrigerate for ~20 minutes. Then add a cookie on top of the marshmallow cream, making a sandwich. Dip the entire thing in chocolate, set on parchment lined baking sheet and refrigerate to let the chocolate set up. You know that magic chocolate hard shell you put on your ice cream? It’s really easy to make and my homemade chocolate hard shell recipe is what I use on these cookies! Just add 3tbs refined coconut oil to chocolate chips. Melt in the microwave for about 2 minutes, making sure to stir it every 30 seconds. Pour over any dessert (like my chocolate dipped cupcakes!) or dip these cookies in it! or any extract you can think of! If you want to change the flavor from the traditional marshmallow all you need to do is add a few drops of extract to the marshmallow cream and stir it in! You might want to use a hand mixer or stand mixer to do this since the marshmallow cream can be a little difficult to stir. Personally I enjoy the marshmallow, graham cracker, chocolate combo! Kind of like a s’more! 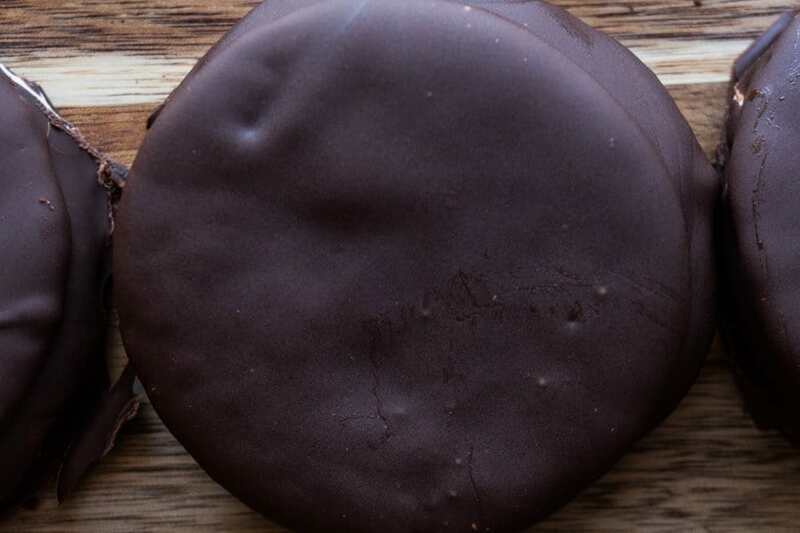 If you want to make mini moon pies just use a smaller cookie cutter (or cup!) to make the cookies. Adjust the cooking time and the amount of marshmallow cream accordingly and you will have mini moon pies! These might be easier/less messy to eat. You can also use crushed graham crackers, sugar, and butter mixed together and then pressed in a pie pan as a yummy pie crust! Oooh you could make a moon pie pie! That would be fun! If you like this recipe check out my Hi-hat cupcakes (chocolate cupcakes with a homemade marshmallow frosting with a chocolate hard-shell)! Last week I also made mini lemon cakes that looked like Hearthstone card packs! So fun! Another not-to-be-missed recipe is my Portal Chocolate Cake! YUM! Don’t forget to check out my full Hearthstone menu! 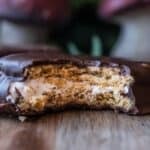 These homemade moon pies are easy and delicious! 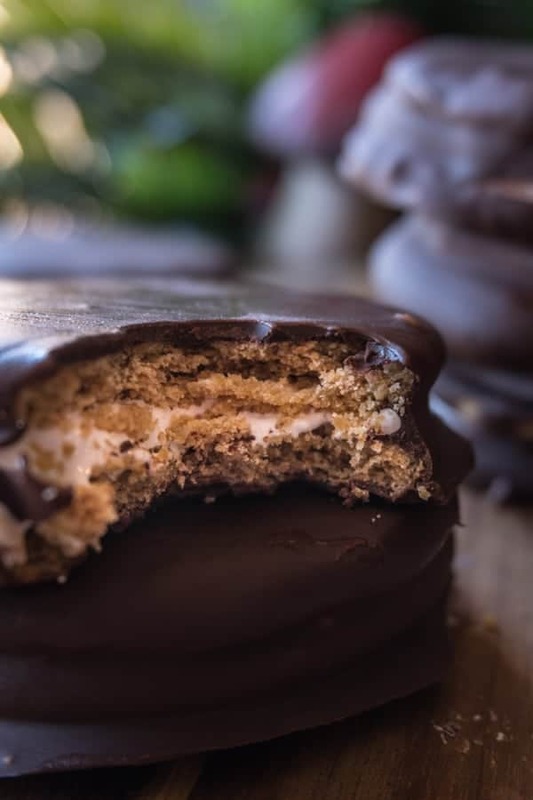 A marshmallow center sandwiched between graham cracker cookies and dipped in chocolate- you’ll want to make these over and over again! Crush the graham crackers until they are grounded fine - use a food processor or just stick them all in a gallon Ziploc bag and crush them. Mix together the crushed graham crackers, flour, baking powder, baking soda, and brown sugar in a large bowl. Add in the butter and milk stirring until combined. Roll out the dough into a thin layer about 1/8 of an inch thick. Using a circular cookie cutter or a cup cut out circles from the dough and carefully transfer them to the parchment lined baking sheet. I like to use a spatula to move them and this helps the circles to stay circles. Bake for 10 minutes. They will start to smell like delicious graham cracker cookies by this time! Remove from the oven and let cool completely! Bake up the rest of the cookies. Once the cookies are cooled, put approximately ¼ cup of marshmallow fluff onto ½ of the baked cookies and refrigerate them. This allows the marshmallow fluff to set up. Refrigerate for at least 20 minutes. After refrigerating, top each mound of marshmallow fluff with another cookie, making a sandwich. Dip the entire cookie sandwich in the chocolate coating, using a spoon to spoon chocolate over the entire thing. Then place the cookie on the parchment lined baking sheet. Refrigerate the chocolate covered cookies to help the chocolate set up. Then cut away any chocolate that pooled around the cookies. In a microwave safe bowl add the chocolate chips and coconut oil. Heat in the microwave for 30 seconds, stir and then repeat until melted. This will take about 2 minutes in total. Around the 1 1/2 minute mark I start to check the chocolate every 10 seconds. ©2014 Blizzard Entertainment, Inc. Hearthstone is a registered trademark of Blizzard Entertainment, Inc. in the U.S. and/or other countries. Oh my these look so yummy! I absolutely love marshmallow and chocolate together. You got me at kind of like a s’more. I do love that combination of crackers, marshmallow and chocolate. 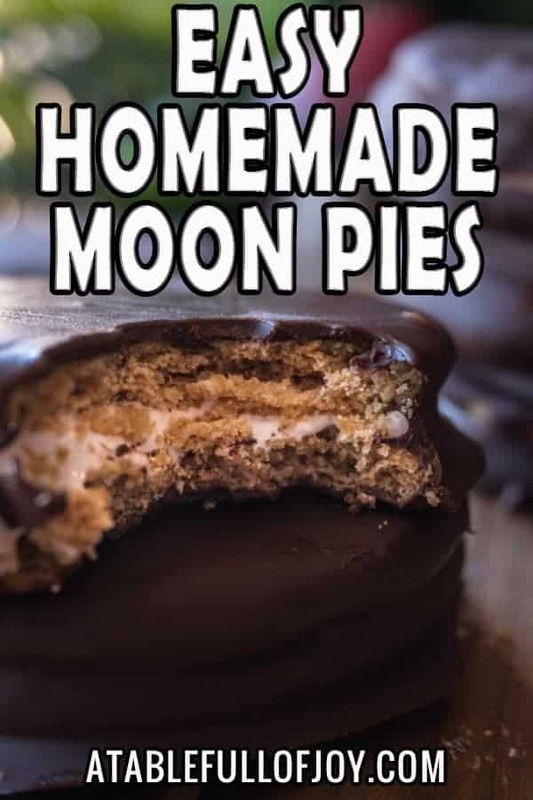 Will have to give this moon pie recipe a try one of these days. what a deliciously scrumptious treat – this looks so good!